You could say Hitch was a man of many appetites. An old school gourmand, he served guests -- and himself -- more-than-ample portions from his well-stocked wine cellar (he loved Burgundy in particular) and aged beef flown in from England. Once, on the set of The Birds, he advised 12-year-old actress Veronica Cartwright, who played the film's Cathy Brenner, on the proper way to broil a steak. He also gave her meticulous instructions regarding wine selection, right down to the best distributor to choose. (It's in Bristol, England.) She apparently never deviated from his wise counsel. I wouldn't, either -- would you? To embellish the board when the places are set. For the ultimate test, more closely examine it. The Hitchcock Supreme has a wide streak of ham in it. I love it!! I've never seen that picture before. Really great find. That is a photograph of director Alfred Hitchcock, that I have never seen neither. Thanks for sharing not only the photograph, but also all the "tidbits" about him (Alfred Hitchcock) in your post. Once again, I hope that you and your family had a good one! 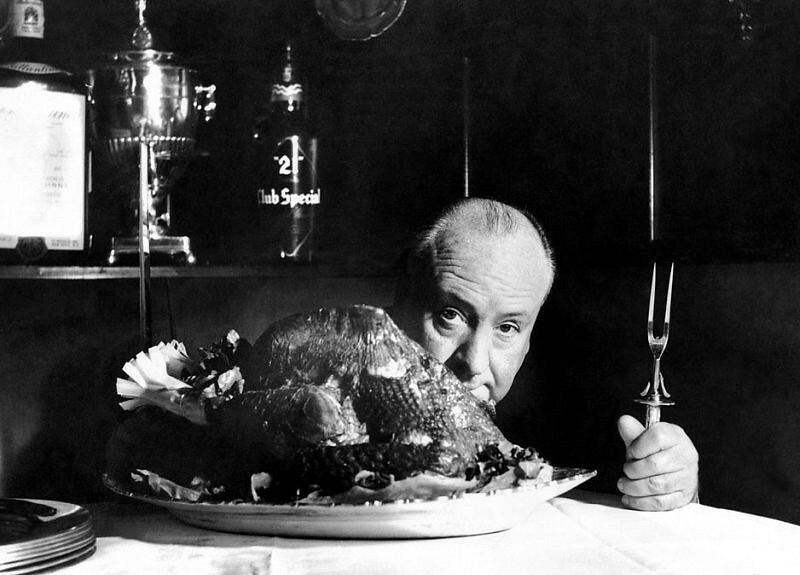 While there are a few hours of holiday remaining, be sure to check out Hitch's appearance on "Vincent Price's (1958) Thanksgiving Special," courtesy SNL. Check out the asking price for this lobby card from Hitch's 1960 film Psycho. As a matter of fact, I just featured this card along with seven other cards from the same set on my blog in August.